One of my favorite activities on vacation is visiting a local cemetery. Not just to view the ornate memorials and beautiful architecture, but to learn about the people that a particular region/state appreciates and associates with its national pride. And then there is Pedro Albizu Campos, the leading figure in the Puerto Rican independence movement. He was buried in the Santa María Magdalena de Pazzis Cemetery in 1965, during a funeral attended by more than 75,000 people. Albizu was a fascinating person – he enlisted with the U.S. Army during the First World War; he went to Harvard, graduating valedictorian in 1921; he could speak six languages (English, Spanish, French, German, Portuguese, and Italian) and read two more (Latin and Greek), was a father of four, and led the Puerto Rican Nationalist Party from 1930 until 1965 as president. His followers nicknamed him “El Maestro” (the teacher) and many streets, schools, and parks throughout Puerto Rico are named after Pedro Albizu Campos. As president of the Puerto Rican Nationalist Party, Albizu lived at the intersection of Calle Sol and Calle de La Cruz in Old San Juan. Today, this historic building is home to several restaurants and bars – Sol y Cruz, St. Germaine, Mezzanine, and Al Fresco. And while it was difficult to choose, my family decided to take a break from the heat and humidity to grab a Pina Colada at St. Germaine. It was a wonderful opportunity to learn more about the life, rather than just the death, of one of the men buried in Santa María Magdalena de Pazzis. According to the bartender, the local police and the National Guard surrounded the house in 1950, and after a fire fight that caused the bullet holes, Albizu was taken into custody for his involvement in the Freedom Movement. He was sentenced to a term of eighty years, but was pardoned after serving fourteen years, on 15 November 1964, as he was in deteriorating health. He died on 21 April 1965. The story was a poignant reminder that while Pedro Albizu Campos was buried with a picturesque view of the Atlantic, he lived a life fighting for Puerto Rico. 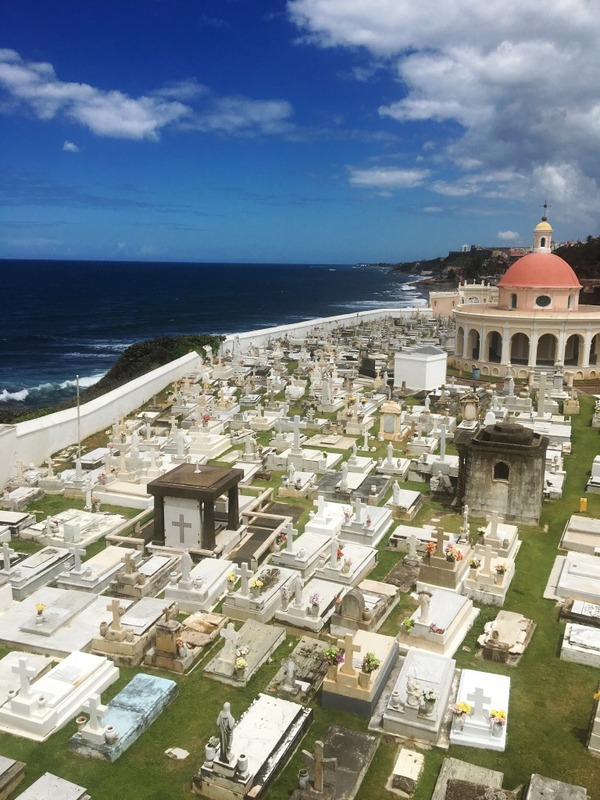 Have you visited a cemetery while on vacation? Do you have a favorite cemetery? Favorite person? Plaque in the mezzanine at St. Germaine. My favorite cemetery is at Bacon Hill, Saratoga,NY. where Ebenezer Bacon is buried in a small typical New England cemetery. The area was named after Ebenezer who settled there in 1794.& where he raised his family.The cemetery is across the road from the white church whose bell was a gift from a family member. Ebenezer & Sarah Bement Bacon are buried there as are many of the family including some of the Fakes. The home where my gg grandparents, Reed & Margaret Bacon Lewis lived is a block away. It was truly a thrill when I visited the area in 2006 & was helped by the local historical society to obtain records of the family. My husband and I also enjoy the same overall aspects to cemeteries. One of my fav was in England where a husband/s tombstone listed the names of all 3 of his wives. A genealogist’s windfall. Also, found a relative who is listed on 2 different tombstones, those of husband #2 and husband #3. She is buried next to husband #3. Another curiosity from my small town newspaper (I left 50 years ago). Two different women/wives put the obituary of the same man in the newspaper. If I have any possibility of an ancestor, I go. My husband, cousin and I mapped our ancestors in a cemetery on one trip. We sent a memo with all the information to far-flung family out to the second cousin level, where much family info tends to get lost. Conversely, when people come to visit us, I drive them to a nearby cemetery where my husband’s ancestors cover a timeline of post-Revolutionary settlement to the Manhattan Project here in Oak Ridge, TN. Stories of real people’s lives get our visitors very interested. To make it fun when younger people get dragged along, I interpret tombstones as hyperlinks to history and the placement of the stones as the family’s social networking site. And long ago, we visited one of the old Elizabethan homes of Queen Elizabeth I of England, near St Albans, and her pedigree was written on the wall. It was taken back to Adam and Eve. I have visited several cemeteries…some where ancestors and other family members lie, and some where no known relatives are buried. Two stand out especially. The first is in West Tisbury, Martha’s Vineyard, Massachusetts where Simon Athearn (1642-1715), the immigrant in my direct paternal line, is buried along with his wife (who was only 13 when they married) and many of their descendants. The other is in Anaheim, California, where his 4x-great-grandson was buried, next to his wife. They both died of tuberculosis when my great-grandfather was very young, and she was known to their son only as Susanna (Goodrich) Athearn. Through the wonders of digital photography and genealogical websites—confirmed by DNA—I was able to discover that she was the widow of a New Englander named Goodrich when she married my great-great-grandfather, and was a 4th generation Californian of Spanish, Indigenous, and African ancestry. Her godfather was heavily involved in drafting Mexico’s terms of surrender to the United States in 1848, and her brother’s godfather—Andres Pico—actually presented the terms of surrender to Frémont. Finally knowing her true identity and sitting at her unmarked grave, knowing that no family member had visited it in many decades, was the most moving cemetery experience I’ve had. of him, sitting. I can tell you that a grave space there sold recently for ten thousand dollars.